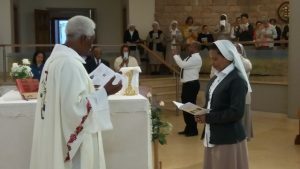 Sister Fiyori Tesfamariam, a Comboni Missionary Sister (CMS), has made her perpetual religious profession this Sunday 12 November 2017 during a special Eucharistic celebration that took place in the chapel of the General House of the Comboni Sisters in Rome. Many friends, family members and members of the Comboni Missionary Sisters gathered with Sr. Fiyori to witness and celebrate her profession of perpetual vows which is a public religious ceremony where a woman publicly professes her religious vows of poverty, chastity and obedience for life. 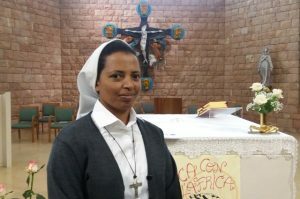 Besides being a consecrated woman from Eritrea, Sr. Fiyori is also a dedicated nurse and has worked in Nzara, South Sudan. She spent two years of missionary service at Nzara Missionary Hospital (also known as St. Teresa Hospital Nzara) located in the Tombura-Yambio Diocese before she travelled to Rome for the preparations of her perpetual vows. 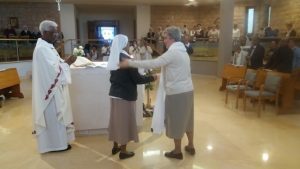 During the Rite of the Religious Profession, Sr. Fiyori asked to be a consecrated woman so as to be able to follow and serve Jesus Christ for all her life in the religious family of the Comboni Missionary Sisters. The General Superior of the Comboni Sisters, Sr. Luigia Coccia, received the vows professed by Sr. Fiyori. Through this sacred commitment Sr. Fiyori will dedicate the rest of her life in service to God and Church as a Comboni Missionary Sister. At the end she thanked God, her family, the Comboni Sisters and all friends for supporting her and sharing this happy occasion in her life. Sister Fiyori Tesfamariam will do some studies before going to mission. While Sr. Fiyori celebrated her perpetual religious profession in Rome, Fr. 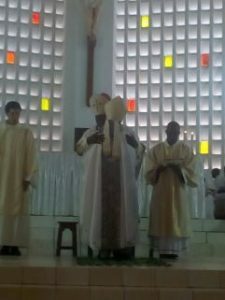 Jesús Ruiz Molina, a Comboni Missionary (MCCJ), was being consecrated as a bishop in the Central African Republic. The ceremony took place in the cathedral of the Immaculate Conception in Bangui this Sunday 12 November 2017. Fr. Jesús Ruiz was appointed as the Auxiliary Bishop of the diocese of Bangassou (Central African Republic) by Pope Francis on 11 July 2017 and was consecrated bishop through the imposition of hands of Cardinal Dieudonné Nzapalainga. The new Bishop was born on 23 January 1959 in La Cueva de Roa, in the Diocese of Burgos, in Spain, and ordained a priest on 11 July 1987. 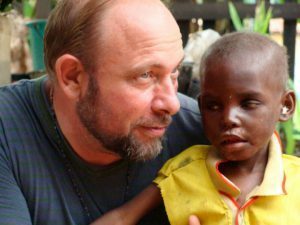 Besides Spain, he has worked as a missionary in the Diocese of Sarh, in Chad, and in the dioceses of Kaga-Bandoro and of M’Baïki, in Central Africa. 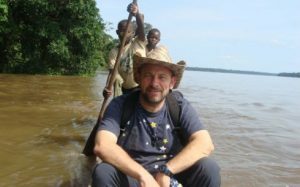 From 2013 to 2015 he was also a Councillor of the Comboni Delegation in Central Africa. The Diocese of Bangassou where Jesús Ruiz Molina will be the Auxiliary Bishop, as well as the whole of South Sudan where Sr. Fiyori Tesfamariam has worked, faces very difficult situations due to ongoing conflicts and famine.